Grab a fork and knife, because October 23 is National Boston Cream Pie Day! 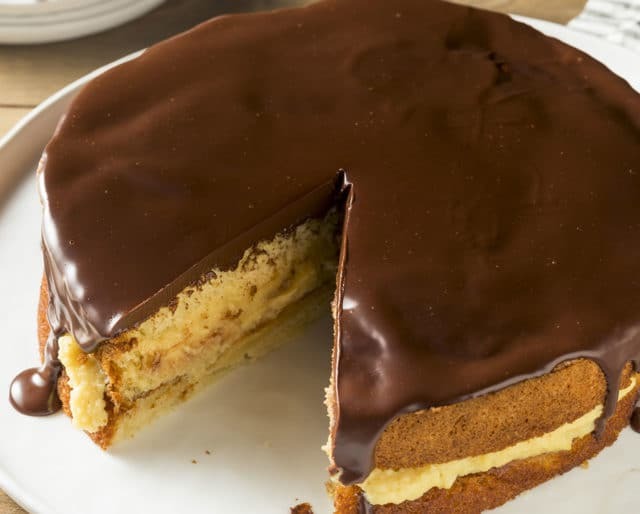 If you’ve never heard of Boston cream pie before, it’s a yellow butter cake, filled with custard or cream and topped with chocolate glaze. (Yum!) Now, we know what you’re thinking: Why is it called a pie, when it’s actually a cake? Well, when the Boston cream pie was first invented, cakes and pies were baked with the same kinds of pans, and even the words were used interchangeably. As a result, the Boston cream pie keeps its old-fashioned name, in addition to its delicious flavor. It was first invented in 1856, by an Armenian-French chef named Sanzian. At the time, chocolate frosting was a fairly new idea, so the delicious dessert took the world by storm. And to this day, it remains a popular menu selection. It’s even the official dessert of Massachusetts! So get your fork at the ready—let’s eat! According to one of our favorite Boston PR Firms the world’s largest Boston Cream Pie is created by culinary students at Southern New Hampshire University. The pastry measured 10 ft wide 1½ ft high and weighed over 1 ton. If you’re someone who loves to bake, then this is the perfect opportunity to give a delicious dessert a try. If you’re trying it for the first time, or if you’re improving on an old favorite, baking your own Boston cream pie is the perfect way to celebrate its national day. (… not to be confused with the Boston Tea Party.) Invite your fellow cake enthusiasts to join you in celebrating Massachusetts’ official dessert. Bring along other Boston-themed foods as well—such as clam chowder, lobster, and Sam Adams beer (if your guests are of age). And what the heck—if you really want to give it that revolutionary vibe, invite your guests to party in period-style clothing! Well, what better place to get an authentic Boston cream pie than in its official birthplace? And while you’re there, check out some of the other excellent experiences that Boston has to offer. Catch a Red Sox game, visit some historical landmarks, and maybe check out the Franklin Park Zoo. Be sure to visit Castle Island—it’s gorgeous. The recipe is so simple—you really only need three ingredients—and yet there's something about the combination of chocolate, cake, and custard that's so comforting and tasty. Not only that, but the simplicity of the ingredients gives you a lot of room to experiment. How many ways can you jazz up a Boston cream pie? Boston has always been a cultural hub for the United States. It was the site of some of the most important events in the Revolutionary War, and has continued to be the birthplace of American traditions ever since. With every bite of a Boston cream pie, you are continuing a tradition of wicked Bostonian trend-setting and innovation that's 260 years strong. You don't really need an excuse to eat cake—but it's handy to have one sometimes. So go ahead and treat yourself—tis the season, after all.